Coenzyme Q10, also known as CoQ10, is a molecular component of mitochondria, which is responsible for converting nutrients and oxygen in the body into energy. On its own, CoQ10 is instrumental in preventing congestive heart disease and myochardial infarction. CoQ10 levels drop radically as you age. Through groundbreaking research, scientist Karl Folkers showed that older patients suffering from severe heart disease showed dangerously low levels of CoQ10 in their blood and heart tissue. Folkers found that supplements of CoQ10 in these heart patients improves their chances of recovery. When combined with supplements of vitamin E, CoQ10 can impact other diseases, as well. Vitamin E attacks and oxidizes low-density lipoprotein cholesterol--LDL, the bad kind. “Life Extention” magazine credits Roland Stocker with the Heart Research Institute in Australia with discovering that when combined with CoQ10, vitamin E becomes more aggressive toward LDL cholesterol. CoQ10 not only strengthens the oxidizing powers of vitamin E, but it can regenerate vitamin E levels in your body, as well, if they fall. Lower LDL levels lessen the risk for heart trouble and vascular diseases. The Natural Health Resource Institute cites a study that showed marked improvement in psoriasis victims given CoQ10 supplements in conjunction with vitamin E supplements and selenium. Psoriasis affects the joints as well as the skin and results in heart, liver and kidney problems. In the study, patients were administered either 50 mg CoQ10, 75 IU vitamin E and 48 mcg selenium or a placebo. Those receiving the CoQ10-vitamin E-selenium combination showed a 37 to 45 percent improvement in psoriasis symptoms. Friedrich’s ataxia is a hereditary disease that affects the nervous system as well as the heart. It causes coordination problems and muscle weakness. There is no cure for Friedreich’s ataxia, or FA. 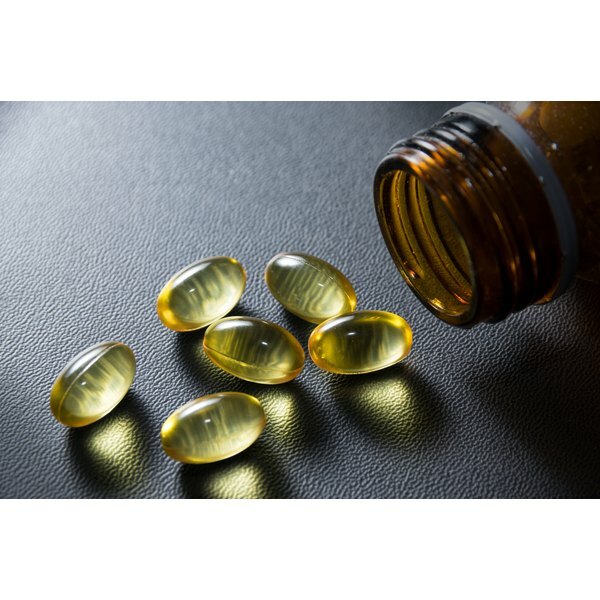 But clinical trials have shown that CoQ10 in combination with vitamin E can mitigate the symptoms of FA by increasing the energy production of muscle and heart tissue, reports the Muscular Dystrophy Association. A synthetic version of CoQ10 has shown promise in reducing enlarged hearts in FA patients. The FDA has not yet approved the use of CoQ10 or vitamin E for ataxia ailments, however, so medical insurance doesn’t cover this treatment. What Are the Benefits of EPA in Fish Oil?